Total Score: 8.58 - INNOVATION AWARD! 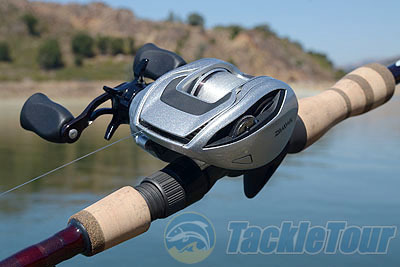 Introduction: The Daiwa T3 is perhaps the most eagerly anticipated premium freshwater low profile baitcaster this season and debuted just a few months ago at ICAST. The T3 features a number of innovations including Daiwa�s MagForce 3D cast control system and the very anomalous looking T-Wing design which flips the front of the reel completely open during casting to reveal the uniquely shaped �T� levelwind. 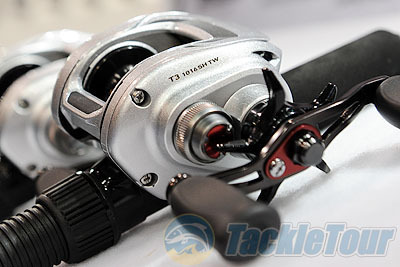 A look back at the T3 right before ICAST 2011, anticipation was high for this unique new baitcaster, was the new system a gimmick or the real deal? 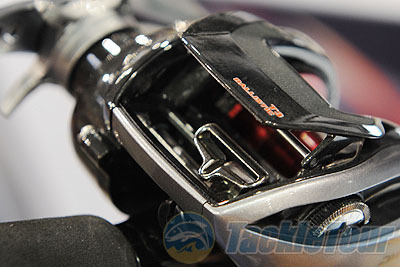 Impressions: This year there were a number of interesting baitcasters at ICAST, Quantum unveiled their extremely ported EXO reel, Abu highlighted the lightweight MGX which won best of show in the category, and Shimano redefined their entire midrange lineup, but it was Daiwa that introduced the most innovative new baitcaster, the T3. 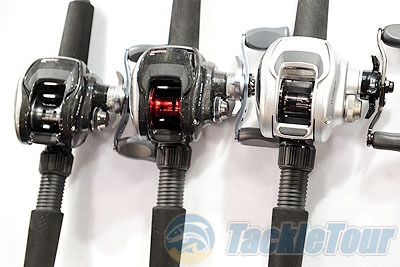 The T3 and T3 Ballistic reels are Daiwa�s first baitcasters to make use of the company�s durable Zaion carbon material, and also features the new MagForce 3D cast control system which offers anglers a much wider range of cast control options. 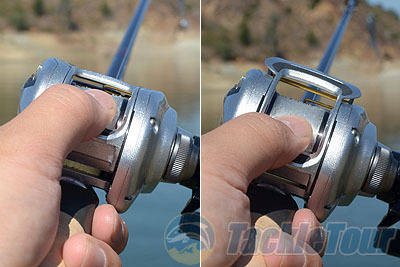 But let�s face it, what really makes this new series of reels noteworthy is the flip open �T-Wing� which is designed to give the line coming off the spool extra space in which to more naturally flow during casts. This is designed to reduce friction because line is not forced to funnel through a narrow opening and in theory should result in longer more accurate casts, as well as a more natural fall from your lures. 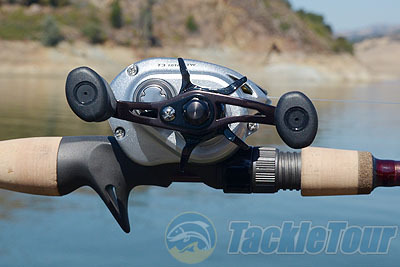 This design gives the T3 a very unique look as the traditional levelwind does not need to be positioned at the front of the reel. With the �T� levelwind concealed under the T-Wing the T3 features an aggressive stealth fighter look. Following the same slanting lines the Magforce 3D knob is positioned flush within the sidelate. At ICAST I checked out all the T3 reels at the booth and found these first reels off the line to be both very smooth and refined. The reel looked ready for primetime but at ICAST Daiwa still needed time to ramp mass production for the hard launch. Bill Liston, the head of Marketing for Daiwa US, told me to come back at the end of the show for more information. After the three days of ICAST the Daiwa booth was my last stop before we headed to the airport. With the show coming to a close the Daiwa booth was already being broken down and the forklifts were ready to move in. Bill smiled when he saw me and I figured I was going to get a scoop on something else in the works, but instead he led me to the back of the booth and handed me one of the very first T3-1016H reels from the show. I played with the reel all the way to the airport and suffice to say I was itching to see just what this new reel would really feel like with a lure tied on the end of the line. Real World Tests: The real world tests for the T3 began exactly 10 hours after we returned to the Bay Area from ICAST Las Vegas. I was eager to see just what this reel could do and hitched up the bass boat and headed straight for the California Delta. Over the next two months I logged as many hours as I could fishing the Delta and local lakes fishing both Berkley Big Game mono and light Toray fluorocarbon with a variety of plastics and hardbaits. I employed the T3 in a variety of techniques including both finesse and power applications throughout the last few months.